Between 19 – 21 February 2019, Pyroban experts were on hand at LogiMAT in Stuttgart, Germany to talk about all things ATEX. 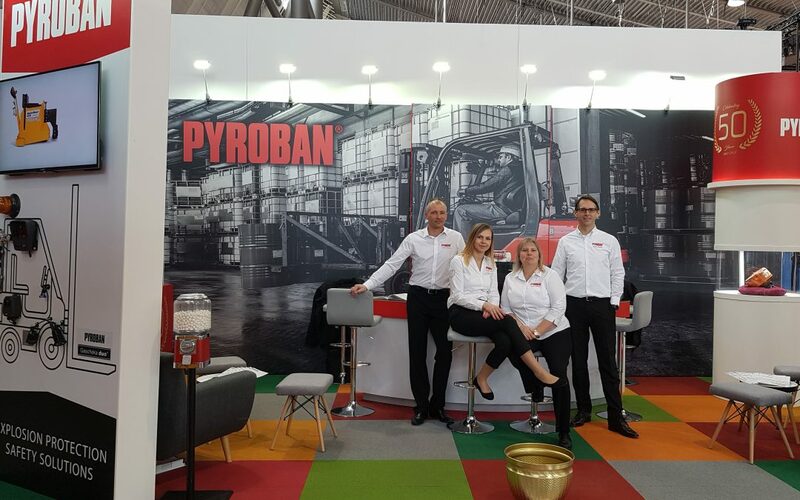 LogiMAT 2019 pulled in a record attendance of over 60,000 industry professionals from across the globe and was a success for the Pyroban team, providing the perfect opportunity to have a catch-up with customers about explosion protection and the importance of choosing an active system over passive in Zone 2. Celebrations began at the event to mark 50 years since the beginning of “Project Pyroban” in 1969. The project was initially started in order to have a zone 2 are above ground to help keep people safe in hazardous areas where an explosive atmosphere may be present. Today, Pyroban (the company), based in Shoreham, West Sussex, helps to keep people safe in a variety of manufacturing and logistics applications, including those in the food and drink, cosmetic, pharmaceutical, chemical, coatings and waste management industries to name a few. At the event, attendees were invited to enter Pyroban’s golden ticket competition. We’d like to thank everyone who visited our stand and entered the draw. 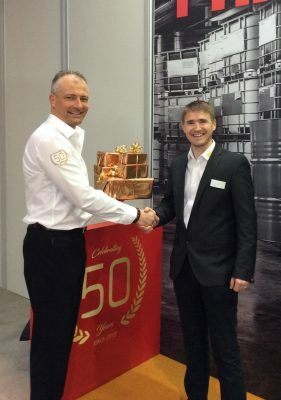 The lucky winner was Bastian Dasbach from HFT Hebe-und Fördertechnik GmbH. If you operate in a Zone 2 hazardous area without gas detection, you may never know if there is a problem. The Pyroban team explained why you should choose an active system over a passive one to be fully aware of your surroundings. Whether you’re purchasing a single component, an engine kit or a fully converted forklift truck, the expert Pyroban team use almost 50 years’ experience and knowledge to provide you with a product which will keep you safe in hazardous areas. If you have any questions about explosion protection or would like more information, visit www.pyroban.com for further details. Alternatively, speak to Pyroban directly by calling +44 (0)1273 465825 or email sales@pyroban.com.